Durable plastic dust pan with brush. Fits most mop heads and push brooms. 54” x 1-15/16”. Removes fine dirt from even or rough surfaces. 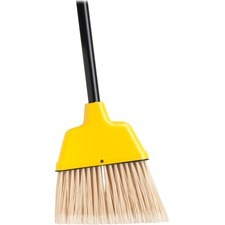 Broom is constructed from 100% corn fibre for stiff sweep action. 1-1/8" Dia. x 48"L handle. Lightweight design with a durable frame and high-performance bristles. 9". Allows for easy pan and broom transport and storage. Reliability for those industrial-strength jobs. Brace adds support and stability. 15".